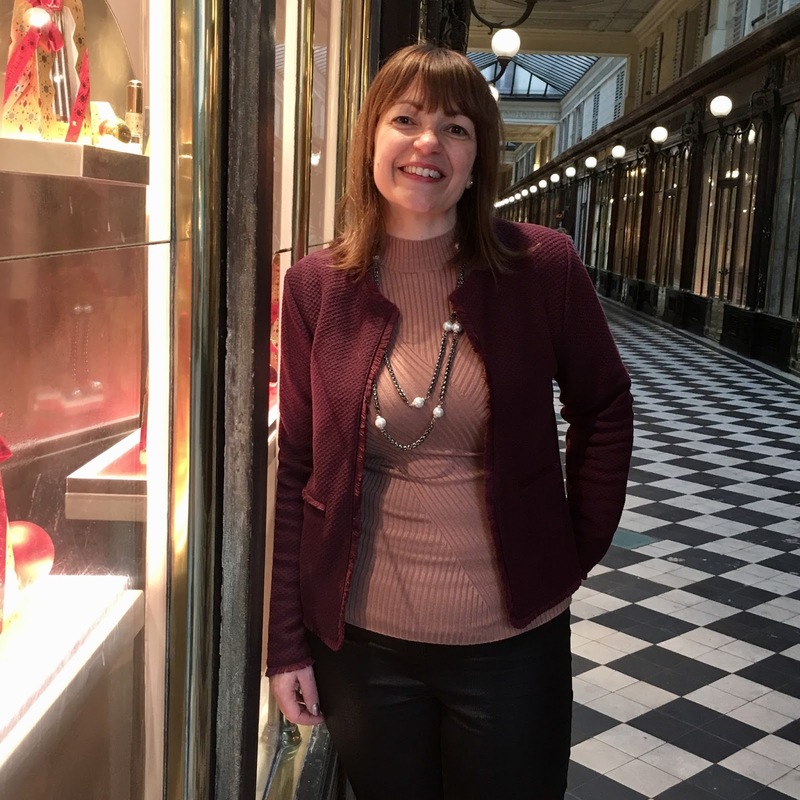 I’ve just got back from a fabulous three days in Paris – it was delightful to be in this city in December with all the Christmas lights and the wonderful retail window displays. Paris was extremely busy with shoppers and tourists but I loved how it was all very Christmassy and buzzing with excitement. A city break at this time of year can prove a little challenging – it’s hard to know what the weather is going to do and what you should pack. 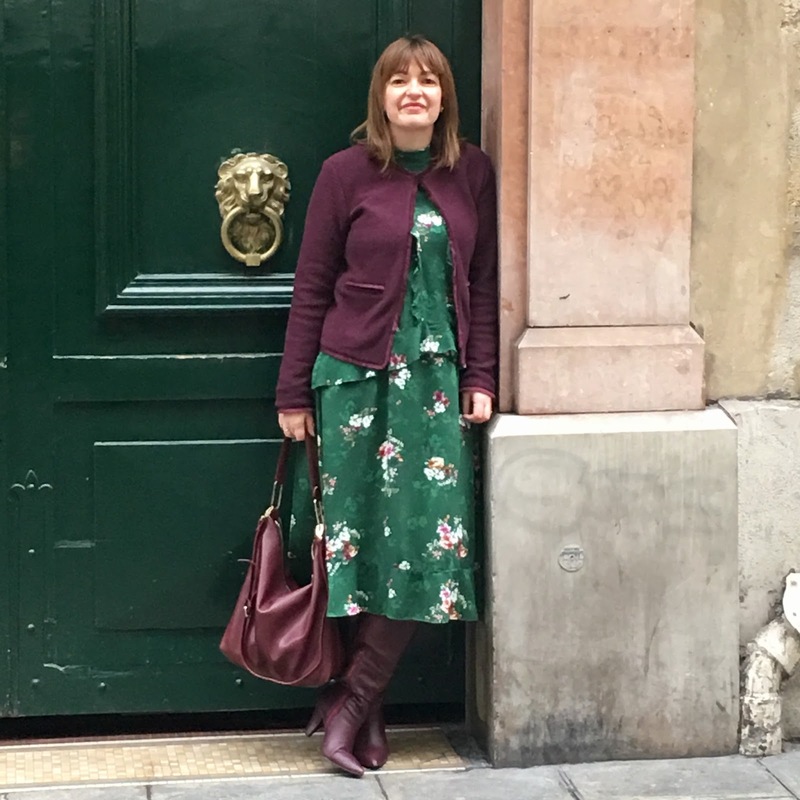 I was invited to take the gorgeous Paris Textured Jacket from the Kettlewell Colours new Winter 2017 range, and I was pleasantly surprised at just how versatile this item was for me and I have to say I was so pleased to have it on this trip, not only because it made me look very glam where possibly a cardigan may have not, but it kept me super warm too! This textured jacket is definitely for everyday wear – no need to save it for best! It’s smarter than a cardigan but less casual than a suit jacket, which for me was just perfect for my trip. I particularly love the fringe detailing, it sort of mimics Chanel and a few people commented about this when I wore it (which made me super happy!). The jacket is lined with a soft jersey material which makes it comfortable to wear; there is a hook and eye fastener at the top to help make the jacket sit flat, this is particularly useful if you want to tie a scarf. I need a size 12 when it comes to jackets of this kind and I found their size Medium fitted me fine. I was pleased to see it was machine washable, that way you don’t have to be too concerned about dry-cleaning bills. The jacket travelled well to Paris, it was folded in my suitcase for the entire journey there, and when I arrive there was no creasing, tick tick tick! 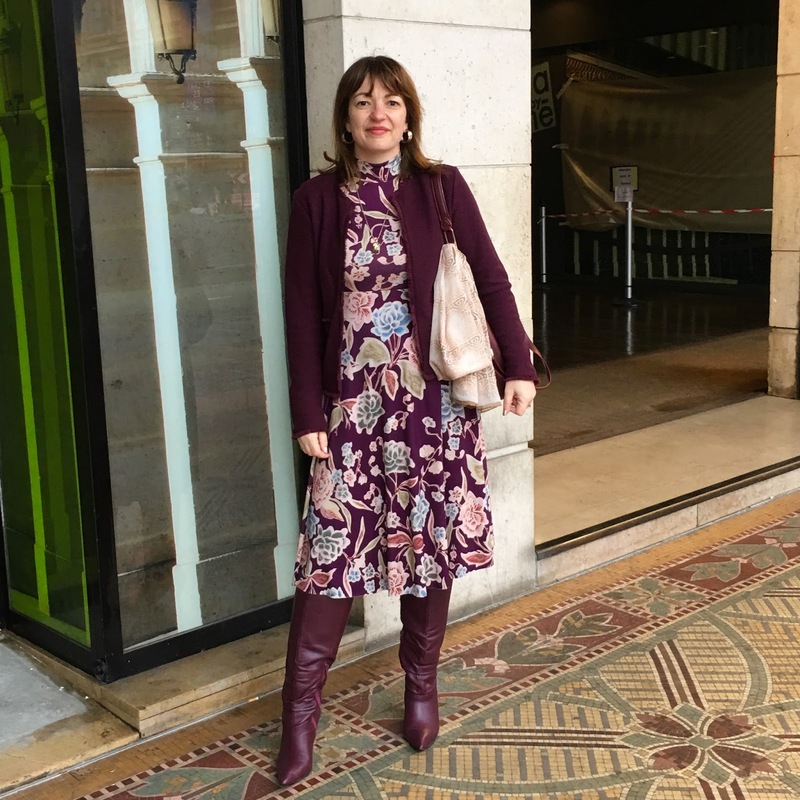 My trip involved, quite a few changes of clothes as I was going to a couple of fashion exhibitions, afternoon tea, dinner in the evenings, plus I had to walk around the city; and I found I took the Paris Jacket pretty much everywhere with me as it mixed in well with what I wanted to wear. I wasn’t expecting this jacket to be that practical, but in fact it was, particularly whilst we sat in cafes watching the world go by it kept me warm and it was slim enough to be worn with my Ted Baker coat over the top, this was great because on my last day, there was rain and hail stones to contend with! The jacket was casual enough to wear with jeans (the ones above are my faux-leather legging from Next) and as you can see the H&M turtleneck (currently in stores) sits very well underneath it – you can style it either with a long necklace (as above) or as I did for the Yves Saint Laurent Museum with my Biba silk scarf. 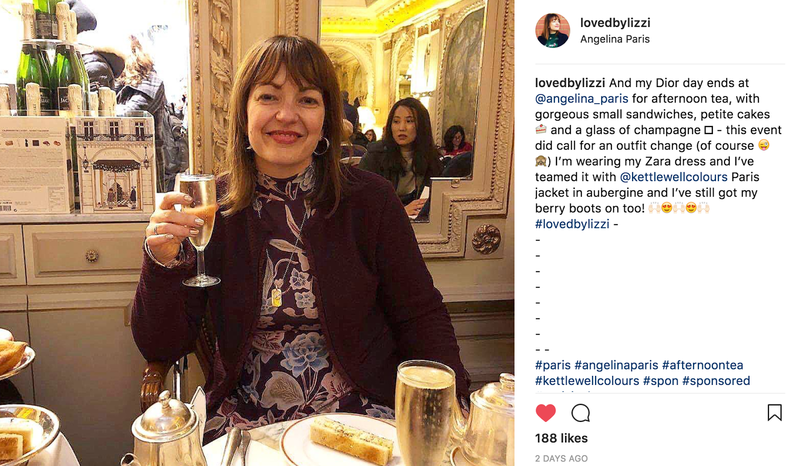 And finally the jacket added a touch of glam to my Zara floral dress for my visit to Angelina’s for a spot of Afternoon Tea, with champagne (of course 😉 ). Top Tip: If you don’t want to tie a scarf around your neck all the time then add it to your bag, that way you have choice throughout the day. 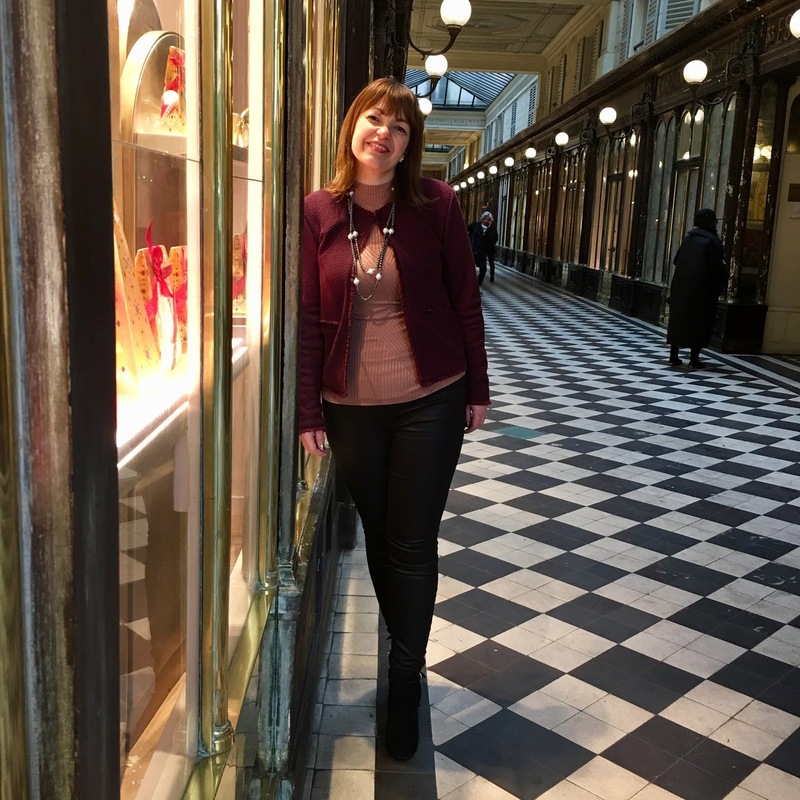 The Paris Textured Jacket comes in six sensational colours, so plenty of choice – with Light Grey, True Red, Leaf Green, Aubergine (that’s the one I am wearing), Marine Teal and Black. You can view the entire selection by simply clicking here. You can follow Martine, a stylist from Canada who’s currently living in the UK, here on Facebook. 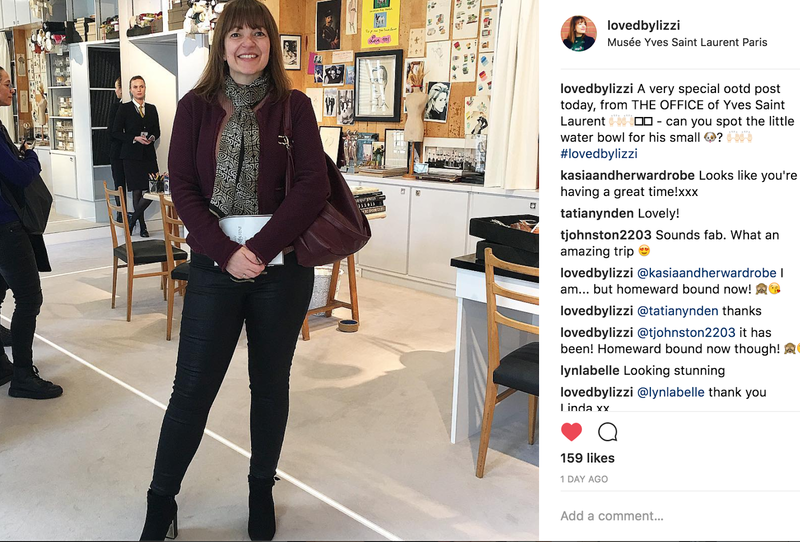 The post Kettlewell’s Paris Jacket – The perfect companion in Paris was on Loved by Lizzi first. The jacket in this post were gifted to me by Kettlewell Colours but I am not part of any affiliates programme with them, so any purchases you make with Kettlewell Colours using the links in this post there are no financial earnings to Lizzi of Loved by Lizzi.